As part of his series on President Lula's Brazil ahead of the 1 October presidential election, the BBC's Steve Kingstone travels to the president's home state of Pernambuco, in the north-east, to look at the issue of poverty. "I didn't know you were coming, everything is a mess," sighs 39-year-old Maria Ines da Silva. Furiously, she sweeps clean the tiny two-room hut which is home to a family of 12. It sits in a small clearing amid fields of corn and manioc tended by family farmers. There are no windows and the bathroom is a hole in the ground a few metres from the back door. The house has no running water and the surrounding earth is hard and dry, but in the front yard Maria shows off rows of immaculately-tended flowers. This is a proud lady. "I think Lula is doing more for us than other presidents," she says, stirring a huge pot of beans as her children begin arriving home from school. "They've given me this card, I take it to the bank and get money." Maria shows off the plastic entitlement card which is her family's lifeline and President Luiz Inacio Lula da Silva's best weapon in the battle for re-election. 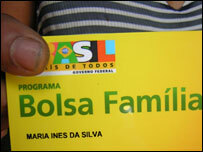 Bearing the words "Bolsa Familia" (family grant) it guarantees Maria $45 (£23) a month from the federal government. In return, she must ensure that her children stay in school and follow a prescribed course of vaccinations. "The coverage of this Bolsa Familia is amazing," explains Tiago Cavalcanti, an economist at the Federal University of Pernambuco. "It's reaching 11 million families or 44 million people - that's 20% of the population of Brazil. So it's huge, and it's going to be very difficult to beat Lula in this election." 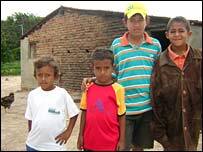 Half those receiving the family grant live in the north-east, Brazil's most impoverished region. Maria's hometown of Manari is typical of the dusty settlements dotted across these drought-prone backlands. But an unfortunate accolade marks it out from neighbouring towns. In 2003, the United Nations Development Programme published an Atlas of Human Development, which identified Manari as having the lowest standard of living in Brazil. The study found the average monthly income was just $13. Almost two out of three adults were illiterate, having spent, typically, less than two years in school. Suicide and child mortality rates were frighteningly high. "They compared us with Haiti," recalls the town's Mayor, Otaviano Ferreira Martins, "and that was really difficult for people here. "Life is tough in Manari - we've no industry, no income. We just plant staple crops and hope that it rains." At first glance there is little to place the town in the 21st Century. 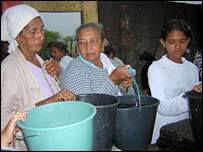 With no running water, women queue at dawn with buckets and washing up bowls to collect their day's supply from a tank which is filled overnight by a water truck. In the main square, pigs gleefully nose through piles of rubbish, and are soon joined by goats and stray dogs. With many shops and homes boarded up, an eerie quiet pervades. In a world such as this, President Lula's Bolsa Familia programme translates into income and food that most families would not otherwise enjoy. Sixty years ago, the president was himself born into the biting poverty of the north-east. His family soon migrated south to Sao Paulo in search of better fortunes, but the feeling remains that this president truly understands voters' pain. "Lula is everything to me, he's like a guardian angel," says 79-year-old Nair Barbosa da Rocha, a great-grandmother. "His family suffered here too, so he really understands what it means to be poor." But the president's popularity rests on more than being just a home favourite. Statistically, Lula can claim to be narrowing the chasm that separates rich and poor in Brazil. During 2004, for example, the very poorest Brazilians saw their incomes leap by 14%, far exceeding the population-wide increase of 3.6%. "It's as if the poorest Brazilians are enjoying Chinese-style economic success," writes Marcelo Neri of the Getulio Vargas Foundation, a respected economic think-tank. Commentators agree that family grant programme is a key factor in reversing Brazil's historic inequality, but many argue that it fails to address the structural problems that underpin poverty. Notably, shortcomings in rural education. "In the short-run Bolsa Familia is alleviating poverty," says the economist Tiago Cavalcanti. "But is it transforming the north-east? No. To do that you need greater equality of opportunity, which means the government should be investing much more in improving schools in the countryside," he adds. Others believe that, by paying more to larger families, Bolsa Familia is encouraging couples in the north-east to have more children - a trend that, over time, will lessen and perhaps reverse the positive impact of the benefit. "Bolsa Familia helps but it's not a solution," says Mayor Ferreira Martins, whose Brazilian Social Democratic Party (PSDB) is the main rival to Lula's Workers Party (PT) in October's election. "The danger is that it will leave the people addicted to handouts. What we really need is for the federal government to set up a business, or project, in Manari to create jobs. Lula may be a son of the north-east but he should be giving us greater priority. That is not a widely-held view. Back in the main square a group of men are arguing over a game of dominos, but there is near-universal agreement about the election. "Of course I'll vote for Lula," says Gilmar, an unemployed father of three. "We're the people most in need in this country, and he's trying to help us." Luiz Inacio Lula da Silva overcomes corruption claims to win a second term. Is Lula's victory good for Brazil?